Urban Orchard, Perth Perth Cultural Centre, James Street, WA, Australia. Enjoying Wine & Food on the City's Doorstep! 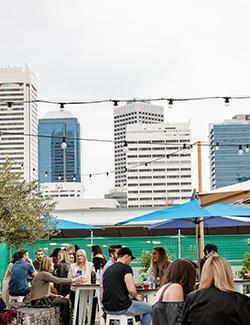 City Wine is place to taste and enjoy amazing wines, share a tapas style meal with friends and enjoy live local music all while overlooking the Perth skyline at the Urban Orchard. The exhibitor line-up features some of WA's leading boutique wine producers, a range of Perth's best food vendors along with a selection of craft brewers, ciders and spirits. You can find the live local music playing in the Entertainment Lounge, soak up the atmosphere with friends in the Garden Courtyard and marvel at Perth's beautiful landscape at the Skyline Terrace. Discover fantastic wine from WA, listen to good tunes, enjoy a meal with friends and top up your cellar for the months ahead. City Wine has it all this June!